When Jeremy and I first started dating he was scheduled to go on a mission trip with the BCM @ ULM in 2 months. I thought it would be hard. It was. It was harder getting a call from a satellite phone with him saying "I have bad news" then it cut out...only to later find out the second he got into South Africa my iPod had been stolen. 3 weeks with your new BF in some hyper rural tribe in Africa baptizing witch doctors was stressful. Who would have known that was a cake walk compared to the news we got yesterday. The news we have wanted and waited to hear a YES to for so long. We finally heard back from Nicholls, and unlike what we were told in June...Jeremy has been accepted for the Spring semester. The email actually said the faculty advised he come in January and he would be given a Graduate Assistant position. Which if you know anything about grad school is a major plus because it covers the cost of tuition. At the same time there is a major downside to this. I can't go with him. I am in my internship with my graduate program and graduate in May. If I left I might as well kiss all the work I've done goodbye. So here we are now, happy he got in, but sad about being separated by about 4 1/2 hours. 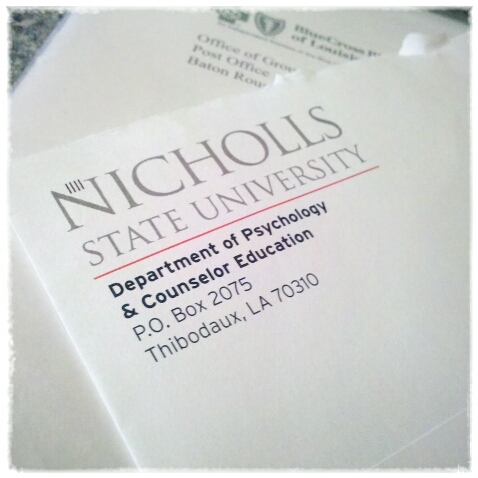 Ya see we live in North LA and Nicholls is way way down south. Like a 45 minute drive would get you wet down south. Oddly living apart doesn't upset my little universe quite as much as the fact that one teacher salary can't support two people living two separate lives. Which now lands me at a whole new level of uncomfortable...I either have to find not 1 but 2 roommates or load our 3 bedroom house worth of junk into storage and beg ULM to let me move on campus until graduation and take out a loan to pay for it. How is it I am married, a 2nd year teacher, and graduate student an I am suddenly being thrown back in the life of a college freshmen? I have got to find something fast. I personally would like to live alone...like I once did and loved...but that is not going to happen. I can live with other people, but I am a loner in that sense. Yeah I can socialize it up in a group situation...but I like my alone time. Looks like it is a Skype marriage for us until May. Has anyone else had to do something like this? I have always heard the first few years of marriage are like this for people.